Kafari (Ahmad Hassam Muhammad) and Jake Hoffman will perform old-time music with Jake on clawhammer banjo and Ahmad playing the bones. Ahmad will bring additional bones for all to try out and play along. Part concert and part sing-along and history lesson. Audience members will have the opportunity to engage directly with the artists, learning to play the bones, lifting their voices in song, and engaging in a communal play-along. Singing, moving, clapping, and clicking along will be greatly encouraged throughout the event. 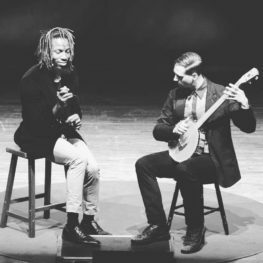 Jake Hoffman and Kafari are two musicians with a love of old-time music, teaching, storytelling, and improvised art. This is a kid-friendly show!